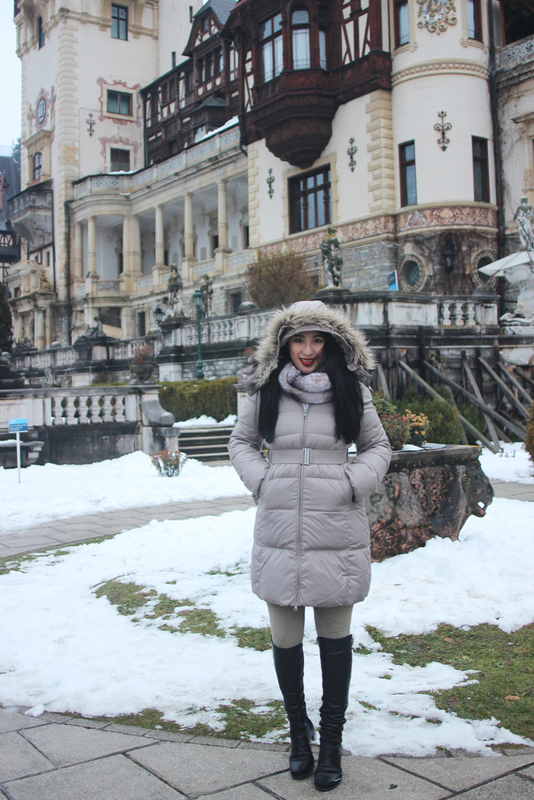 In Transylvania, northwest of Sinaia in Prahova County, is a fairytale castle rising from the mist and firs of the Carpathian Mountains. 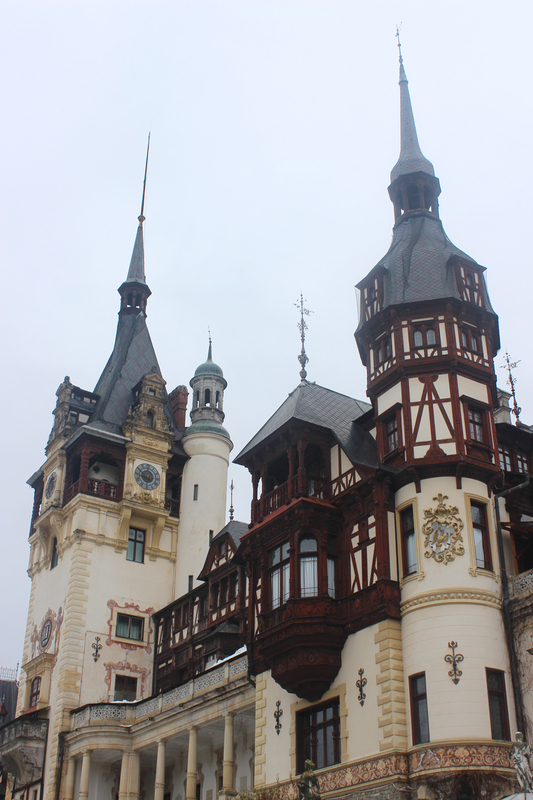 Peles Castle is a palace one recognises from many different stories, each sum of its parts seemingly emerged from a different dream or storybook, and verily this is true for there isn't one style that defines the architecture. 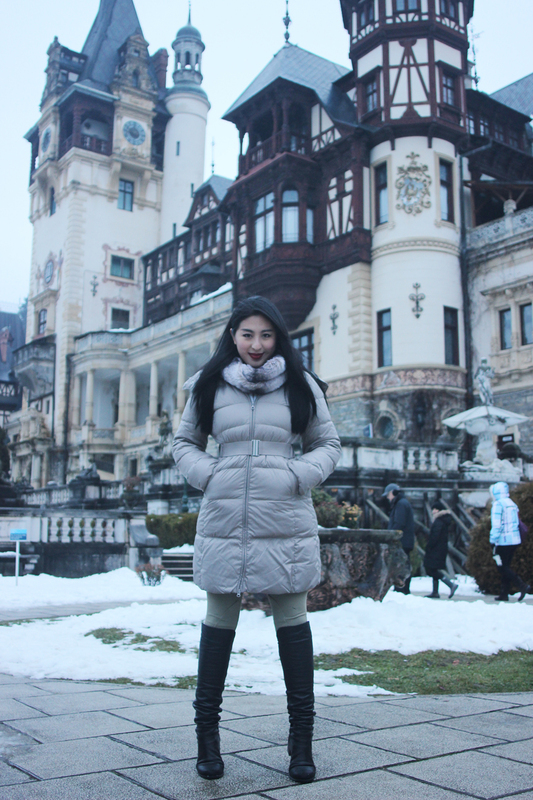 Peles Castle is a romantically inspired blend of many styles: Neo-Renaissance and Gothic Revival not unlike Schloss Neuschwanstein in Bavaria, with Saxon influences of allegorical hand-painted murals and northern European alpine ornate fachwerk in the interior courtyard facades. 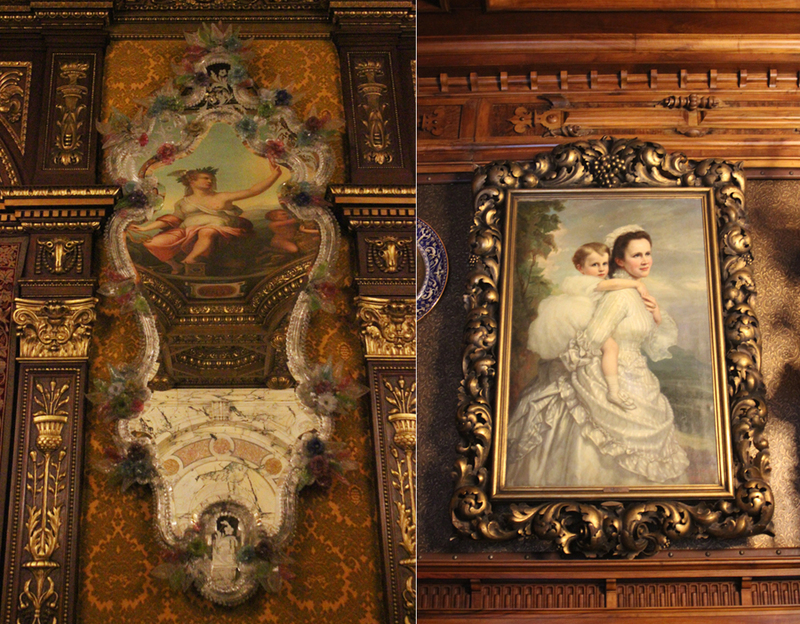 The smorgasbord of styles was designed to appeal to the tastes of King Carol I of Romania who wanted a grand palatial alpine villa amidst the magnificent mountains he loved, with a mix of European styles: Italian elegance and German aesthetics along Renaissance lines. Henry and I eschewed the many 'one day, two castle' tours touted everywhere in Brasov and instead decided to devote the day to Peles Castle, saving Bran Castle (Dracula Castle) for today. Rather than pay €140 (€70 each) to be herded onto a bus with hordes of others, only to be rushed through the castles before being quickly shepherded back on the bus from Bran to Sinaia and back to Brasov, we decided to set our own pace at the perils of being ripped off by unscrupulous taxi drivers and possibly wander off the path to be eaten by wolves. We merely walked to a taxi rank in Old Town, armed with the knowledge that the distance from Brasov to Sinaia was 50km and at 1.35 RON/km would be less than 70 RON/ £12.50 according to the taxi metre. Of course we accounted for the fact that the taxi driver would have to drive back and we were prepared to pay double to make it worth his while but happily we were quoted 100 RON to and 90 RON back. 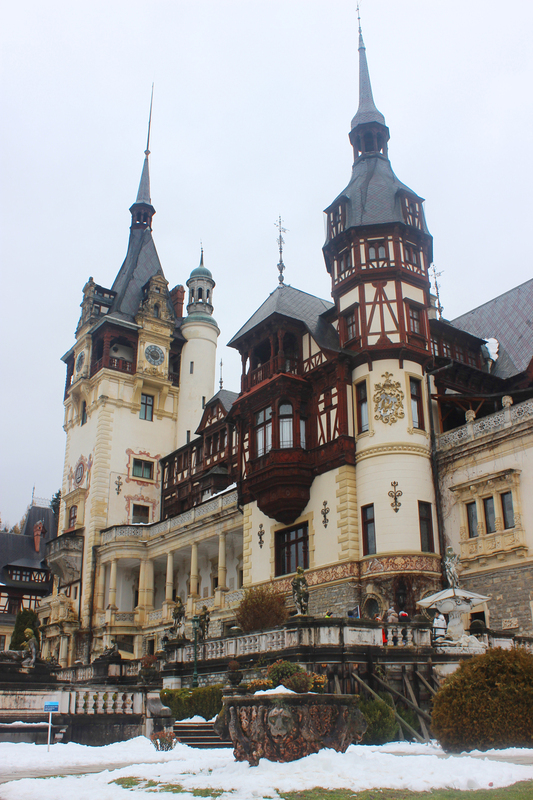 190 RON/ £34 for a return journey and 164 RON/ £29 for entrance (plus a photography fee) brought our intrepid Peles Castle trip up to £63. I daresay the trip to Bran Castle will be far cheaper as Bran is only 30km from Brasov, bringing our costs of doing it alone (in comfort, too) less so than engaging a tour. Either way, an independent trip where we could explore at our leisure, free from the shackles of someone else's itinerary is worth every penny. Now that the essential but boring facts about cost is out of the way, let us resume our Romanian roaming. 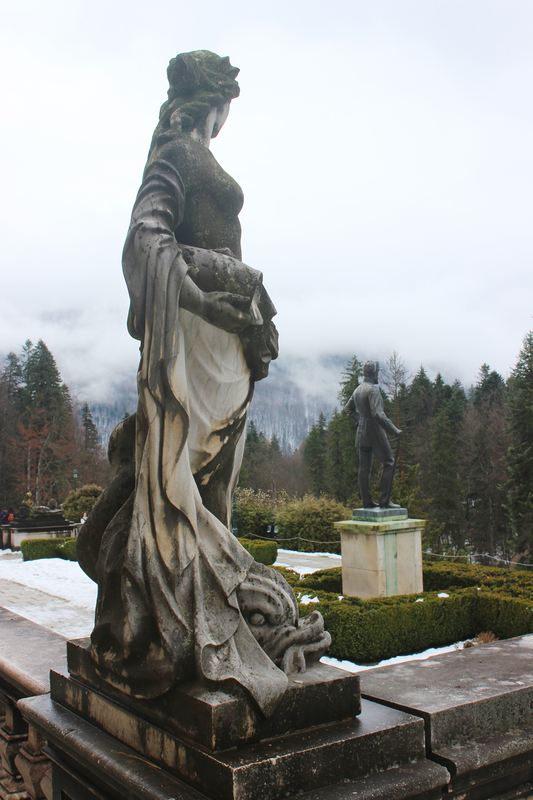 Mist rises from the Carpathian Mountains and encroaches onto the palace grounds like a cloud. Amazing how since 1897 the landscape of Bram Stoker's Transylvania has seen little change over the years. The same mysticism of the domineering mountains, so full of secrets (and wolves, bears, possibly vampires), danger, and beauty remains as one of Europe's last bastion of pristine forest. 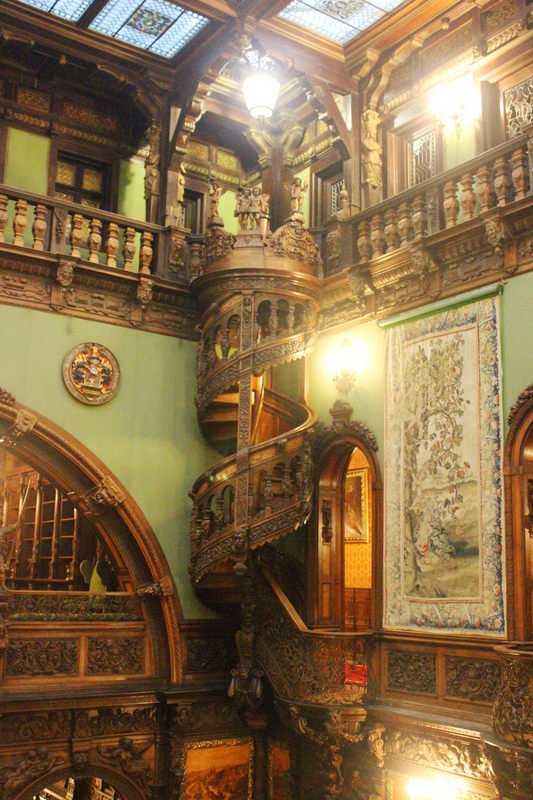 Inside Peles Castle, the decor is mostly Baroque influenced with carved wooden arches, exquisite fabrics, and more chandeliers you can shake a stick at. The thing about European palaces is, I believe that once you've seen one (make it five) you've seen them all. Controversial, but I tend to find the insides of European palaces quite same-y, and that goes for the Spanish-influenced Palacio de Los Capitanes Generals in Havana, Cuba. Even the 'exotic rooms' decked out in the style and riches of the Orient, Turkey, and the Middle East, as beautiful as they are I've seen them all before all over the world. 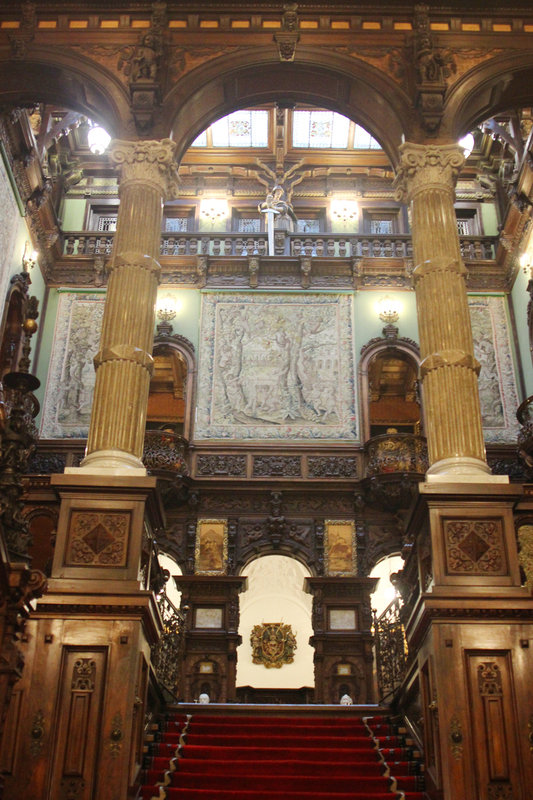 That's not to say that the inside of Peles Castle is not at all worth the look. 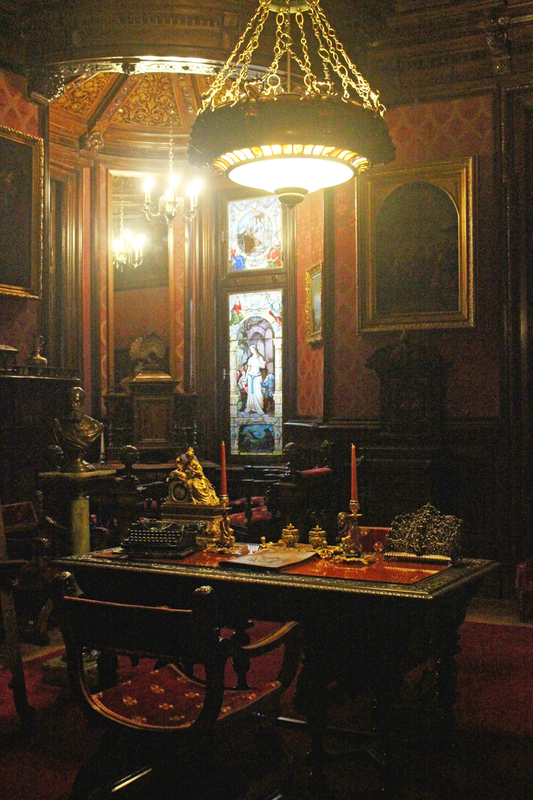 There are many things of beauty of wonder, but I'm only sharing photos of the rooms that stood out to my jaded eye. This spiral staircase was the first of its kind I've seen inside a royal residence. I loved how precarious it looked, this slender curly thing clinging to the corner of the first and second floor dangling over the ballroom below. Henry was mostly dazzled by The Great Hall of Arms (naturally) and remarked that the weapons on the wall look like beetles. 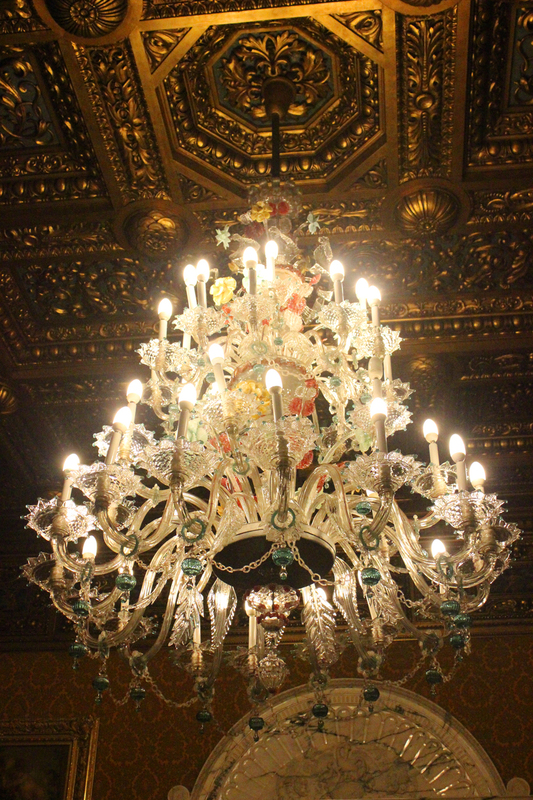 I had to include this chandelier because the pastel colours and plastic-like effect of the ornaments made it look like little sweets. Among the rich fabrics and heavy woods of the Florentine Hall it looked almost garish in a retro, 1980s way. It comes with a matching mirror, too! 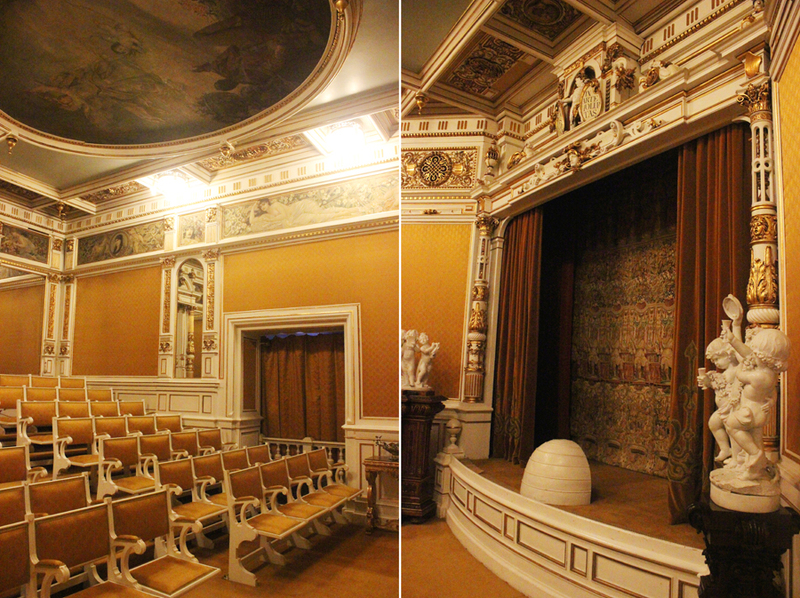 One of my favourite rooms was a small and modest theatre room. I also enjoyed this cozy study. Haven't I always said that I am drawn to small spaces? It must be my subconscious instinct for surviving life in a big city on limited funds. 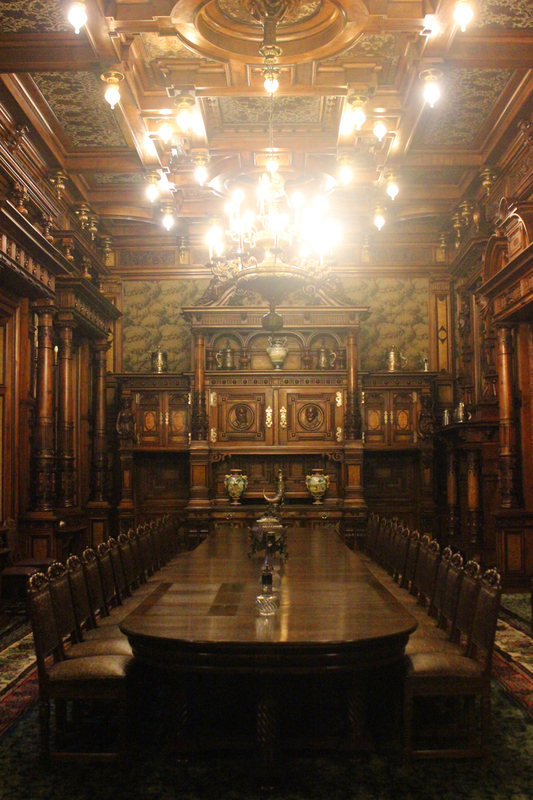 But if grandeur and cavern-like rooms are your place to go to, fear not, Peles Castle has a room for you. 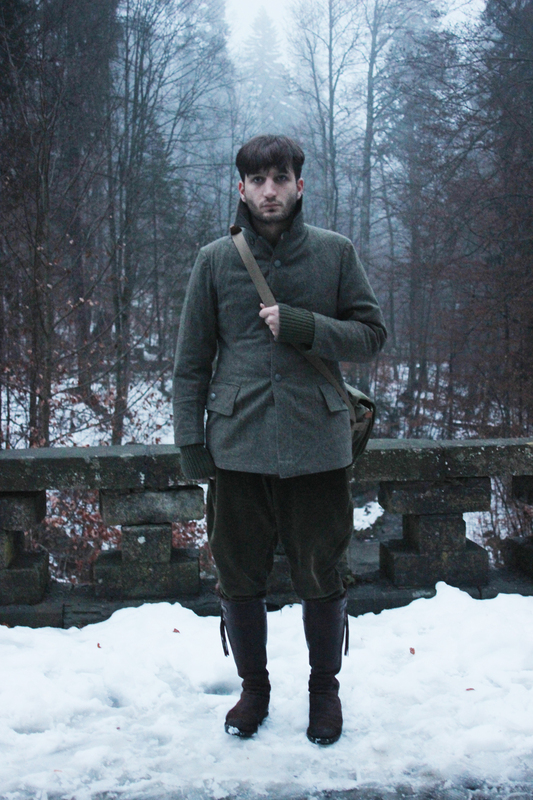 After wandering the inside of the palace for a good couple of hours we stumbled outside to find that the sun had all but disappeared behind the mist, casting everything in a wintry shade of blue. The light was so atmospheric and really set the tone (hahahaha) for photos. Doesn't this shot of Henry look like it could be from a movie still? I'm obsessed with taking film-like photos of him. He simply photographs better than I do. A much more controlled and confident stance. 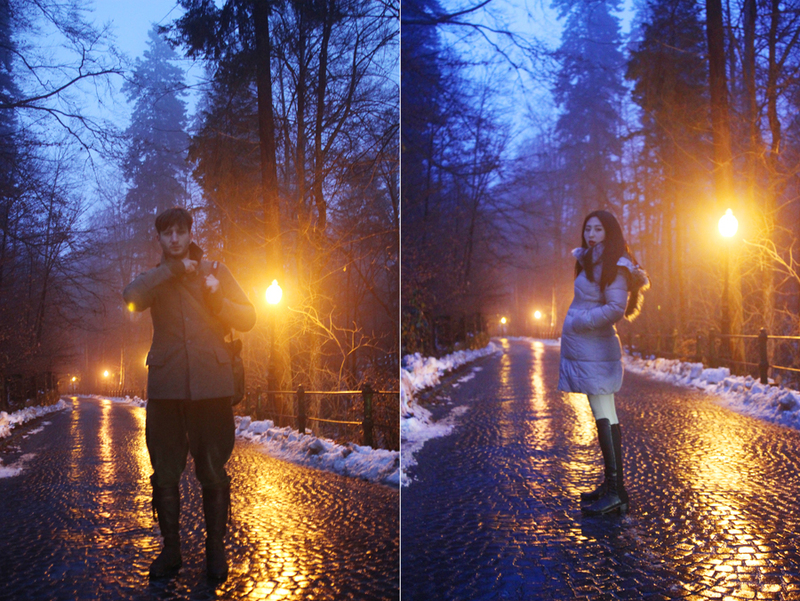 I was however less confident in our ability to return to Brasov in the cover of ever-approaching nightfall without being eaten by wolves/ mauled by bears/ bitten by vampires, so we hastily walked down the hill to search for a taxi that would take us on an hour-long drive back to Brasov. The darker it got, the more decidedly vampiric the place looked. "There's something behind me, isn't there?" Off the path we noticed a fiery glow in the distance. Was it villagers approaching with pitchforks and torches? 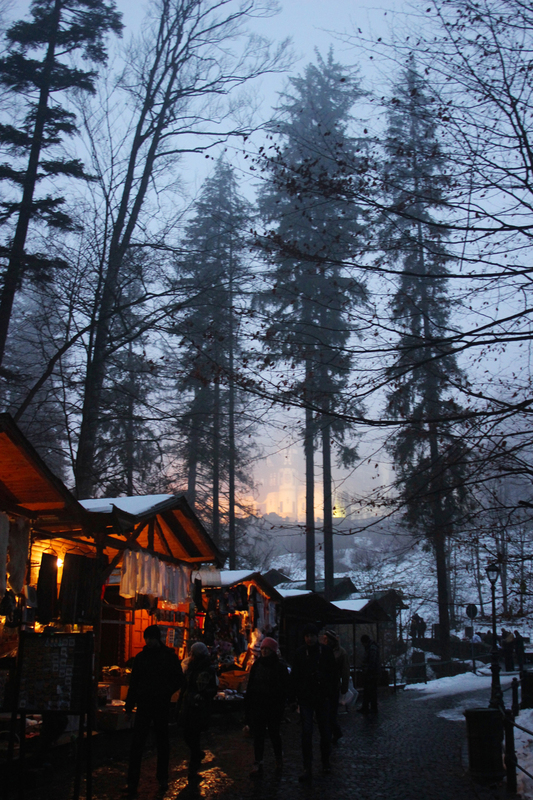 No, it was simply Peles Castle, lit up for nightfall, a beacon of warmth in an otherwise inky-blue landscape. Romania is relatively expensive now (although still a bargain travel destination compared to other European capitals like Paris and Rome) and I imagine it will more so when it becomes more 'mainstream'! What an amazing place! I would love to visit it one day.